Bad breath really stinks! Not only because of the negative social aspect, but because of what it can mean for your oral health. It can be an indication of improper oral hygiene techniques, or even deeper problems. 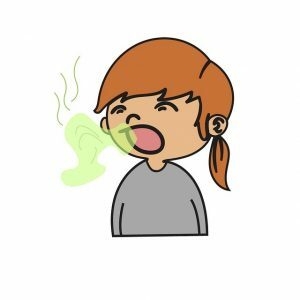 Here are a few causes of bad breath, along with remedies that can help. Leftover food between your teeth promotes bacterial growth and lingering odors. Eating foods with strong scents such as garlic and onions can also contribute to prolonged bad breath. In general, make sure to brush and floss twice a day to keep your mouth clean. Brushing after eating also helps remove those food particles that stick between your teeth—especially if you’ve recently eaten smelly foods. Brush your tongue to help remove bacteria, or use antibacterial mouth rinse and toothpaste. An overall lack of saliva is the biggest cause of bad breath. Saliva helps rinse food particles from your mouth, so if you have dry mouth, those food particles are hanging around for longer than they should. Certain medications can also have the side effect of a dry mouth. The best way to remedy a dry mouth is to drink water to keep your mouth moist. You can also chew sugar-free gum can encourage the production of saliva. An antibacterial mouth rinse and toothpaste is a great way to rinse away cavity-causing bacteria. If you’re taking a medication that has the side effect of a dry mouth, consider asking your doctor if there is an alternative medication. If there isn’t an alternative, make sure you drink plenty of water. If you brush and floss your teeth every day but still notice that your breath doesn’t stay fresh for long, you may have an underlying medical condition. Visit your dentist to check whether you might have periodontitis and discuss other causes of halitosis. You may have an undiagnosed or underlying medical condition. When dentures don’t fit well, there are plenty of spaces for food to become stuck after eating, which can certainly cause bad breath. Getting your dentures adjusted helps keep food particles out of those hard-to-reach areas. If you can’t get your dentures adjusted right away, then rinse your mouth as soon as you can after eating. This will help keep bacteria-causing food particles under control until you are able to make an appointment. In general, chewing tobacco and smoking cause bad breath not to mention many other issues. It’s best to avoid these products if you want to maintain a fresh, healthy mouth and prevent other health issues including high blood pressure or oral cancer. If you wonder what might causing your bad breath, request an appointment today and let us help you breathe easier! Process of resurfacing the tissue side of a removable prosthesis with new base material.